ClosetMaid 2891 Shelftrack is an extremely useful closet organizer kit which can be safely installed in a closet with a 7 ft to 10 ft width. The combination of adjustable shelves and SuperSlide shelving makes it an ideal choice for someone who loves to have things in their proper places. This easy-to-install, vinyl-coated closet organizer is good investment for anyone who is looking to increase their storage space. The best thing about this closet organizer is that it can be configured in many ways and can fit multiple closets. As the shelves are adjustable, they are good choices for a baby or a toddler’s closet where you need to maximise the usage of every inch of space to keep things. Plus, if you love the concept of walk-in closet where you can view each and every item, this unit can fulfill that purpose too. This unit is quite easy to assemble and helps to enhance the functionality and effectiveness of any closet. The adjustable shelves are useful for any sort of configuration and you have the liberty to design the closet in any way you want. The smooth white finish makes it a stylish choice for any kind of closet. This is a complete storage system with adjustable standards and bracket programs. The unit has offers ease in sliding hangers for users and the hang rods are systematically engineered to be attached to the shelves. The metal wires are absolutely durable, ready to support weight of any kind. The smooth white finish makes it all the more charming to use in any closet; the vinyl-coated steel helps to hold the shape for years. Pre-planning is an integral part of installation; measurements of the closet should be done carefully before installation. At times, the shelves need to be trimmed or cut to fit the closet space. The shelves have no unnecessary ornamentation; those looking for something very stylish can find it too simple for their choice. Reading the instruction manual is a must, before installing the unit. Two other things that are absolutely essential for setting up the unit is familiarizing with the different parts of the unit and following all the safety precautions. The system is designed to be mounted on the wall, and if you are looking forward to reconfigure or rearrange any of the shelves, all items should be removed from the shelves before the process is initiated. 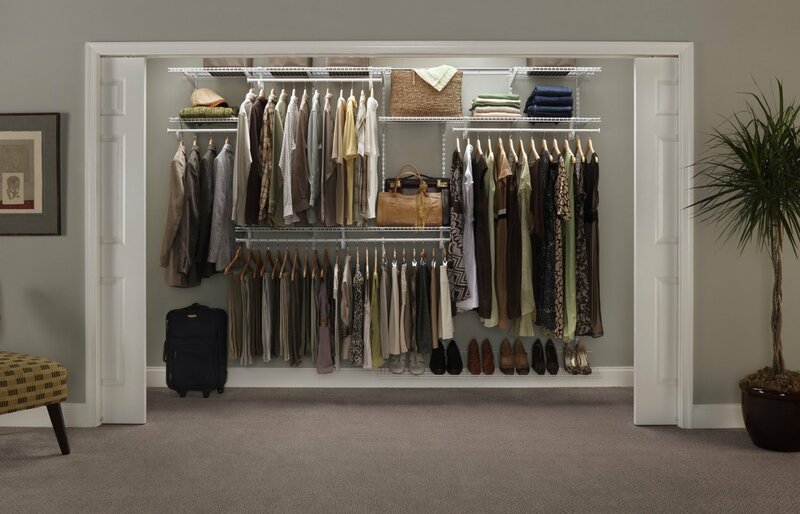 The closet organizer is extremely versatile and can be configured after seeing the dimensions of the closet. The hang tracks need to be installed carefully, but there should be a 10 inch gap between the 30 and 40 inch hang track. Knowing the measurements and the exact space of the gap are crucial for installing the unit. You should also determine the wall type and mark track location on closet wall, before installing the hang tracks. The brackets are also adjustable, which helps to make the shelves flexible. ClosetMaid 2891 weighs about 42 pounds, and has 15 feet of hanging space along with 19 feet of shelf and 5 feet of shoe space. You can easily configure the shelving style, as per the design of your closet. The shelves are 12 inches deep, which makes it extremely useful for storing all kinds of items of various shapes and dimensions. The weight capacity of each shelf is almost 80 pounds, allowing storage of a number of personalized items. There are 3 closet rods and the hanging space is ample to hang all closet essentials. The shoe rack can sometimes pose a little difficulty for heels; but if there is enough room, you can simply keep the flats on the rack and heels under it. Whether you buy the ClosetMaid 2891 from a virtual store or a real one, you will be glad to know that this amazing product is made from vinyl-steel which makes it worthy of warranty. If you want, you will also get a manufacturer’s warranty for this amazing product. Along with the ClosetMaid 2891, you can also buy shelves of different dimensions or shoe racks if you want. The adjustable brackets and standards help to install shelves and make your closet perfect and uncluttered. Those who love shoes can also add a shoe rack to this entire unit to store more shoes. ClosetMaid 2981 is perfect for those who love perfection and precision. It is also good for those who love the luxury of designing their closets in their own way, and if you love variation in the look and feel of your closet, ClosetMaid 2891 is a perfect choice for you.